Last night was the first night home for our new beagle puppy. She is so adorable! 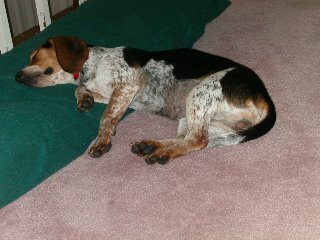 I admit it wasn't love at first site for any of us when we went to the humane society looking for a terrier, possibly, and also to see a lovely beagle named Highway (now gone from the Humane Society site - hopefully adopted?) that we saw featured on the website. Highway wouldn't work for us with the boys, but he led us to check out the other beagles and found a darling of an 8 month-old girl. Ours ran eagerly to see the man of the house for pets and scratches, then tackled the eldest child gently and lay on top of him. So much for the reticent girl I'd perceived in the kennel! She has the most amazing howlish baying type of voice when greeting other dogs (heard that at the h.s.) and absolutely no barking so far (but quite a lot of snorting and wuffling). All of this activity only 2 days after surgery, although she still hasn't tacked the front stairs. She is just a complete sweetheart, very mellow, very gentle. She responds well to correction and direction, and has already melted hearts enough that she is allowed up on the couch despite prior agreements to the contrary. Last night I stayed up late reading with the dog sleeping nearby, with that new-mother's feel of not letting the baby sleep unsupervised. When I finally went off to bed she looked at me so mournfully, that I carried her pillow into the room to let her sleep on the floor at the foot of the bed. The book that kept me occupied last night, coincidentally, was The Curious Incident of the Dog in the Night-time by Mark Haddon (ISBN 0-385051210-4). Which has a dog at the core of the story, but really in't about a dog at all. I found it a quick and interesting read, though possibly not much good as a representation of an autistic, though I haven't the expertise to know for sure. The protagonist, Christopher, was an immensely pitiful character giving no self-awareness of how pitiful he his. What kept my attention though was the story of his mother. Let's see if I can review this without a spoiler: Christopher has a few talents, mathmatical and eidetic, which offer some recompense for his face-blindness and inability to understand emotions or humor. This 'blindness' is also shown in other people, and is far less excusable. The mother's actions, even in light of Christopher's condition, seem immensely cruel. And she, too, seems particularly blind to this essential fact. In fact, all the key characters - his father blind to the lack of common sense involved with trying to raise a latchkey autistic adolesent (the very phrase surely raises neck hairs on a few parents of autistic children), Mrs. Shears' ignorance of Christopher's father's unexpected temper, even the tangental character Mrs. Alexander seems uncomprehending of Christopher's nature. Check out the policeman's blindness in an excerpt, to see how ignorant one can be when jumping to conclusions. Christopher strikes me as one of the most unique heroes I've seen in a while, trundling blissfully unaware from one circumstance to the next, evading danger and solving riddles a'la James Bond with none of the panache or self-satisfaction. A quite bizzare but interesting read. I wonder if the parents' behavior can be seen as a sort of 'suppressed' or 'mild' autism, their mutual lack of sensitivity combining to create autism in their child. (I speak in terms of the novel's symbolism, not in medical fact.) Or perhaps the mother's anger is caused by worry about what Christopher's autism says to the world about her. The characters may seem insensitive and selfish, but surely that can be realistic.